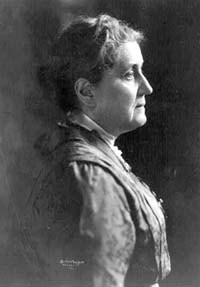 Jane Addams (1860-1935) exemplified activism dedicated to creating holistic solutions to the challenges faced by real people. Inspired in part by the Toynbee Hall settlement house in London’s East End, where university graduates lived in community with working class and poor people, Jane Addams and Ellen Starr founded their own settlement house on Chicago’s West Side in 1889. Chicago was a rapidly growing industrial and commercial center linking the eastern and western United States. Thousands of people poured into urban neighborhoods to work for the city’s factories and merchants but found the working and living conditions in industrial districts abominable. Work hours were long, employers did not pay decent wages, housing was overcrowded, schools were inadequate, city services like sanitation and police protection were underprovided, crime and disease were rampant, welfare agencies were overwhelmed, and immigrants were regarded with suspicion and contempt. Jane Addams could have continued her comfortable, middle class life. She chose, instead, to move to Hull House and share the life of the poor and marginalized local community. Hull House, Addams insisted, was not a “philanthropy.” It was a solidarity movement. The residents of Hull House, motivated by the belief that “the good we secure for ourselves is precarious and uncertain… until it is secured for all of us and incorporated into our common life,” lived in the neighborhood and worked for the common good and benefit of every person. Each person had equal dignity and value, every neighbor had a responsibility to do fellow neighbors good, and each person, if given the opportunity and means, had something to contribute to the benefit of all. The work of Hull House began simply, the residents caring for children of working parents and nursing the sick. By the second year, Hull House provided kindergarten classes in the morning, club meetings for older children later in the day, and clubs and educational courses in the evening for adults. Over time the settlement grew to include an art gallery, a public kitchen, elder care, a coffee house, a gymnasium, a swimming pool and public baths, literacy and citizenship preparation classes, health clinics, immunization programs, a book bindery, an art studio, a music school, a drama program, a circulating library, a cooperative residence for working women, political discussion groups, a meeting place for labor unions, a labor museum and an employment center. Though deeply rooted in the local neighborhood, Addams’ activism extended well beyond it. She was devoted to causes like women’s suffrage, the rights of children, the peace movement, the eradication of racism and other progressive and reform movements. She served both on Chicago’s Board of Education and as a garbage inspector for the Nineteenth Ward. She helped to launch the Immigrants’ Protective League, the Juvenile Protective Association, and the first juvenile court in the United States. She was a leader in the Consumers’ League, the National Conference of Charities and Corrections, the Campfire Girls, the National Playground Association, the National Child Labor Committee, the National Women’s Suffrage Association, and the National Association for the Advancement of Colored People, among many others. She worked for the passage of laws to protect women and children, for the passage of state and national child labor laws, and against capital punishment, especially for minors. Believing that peace should be defined, not as “an absence of war, but the unfolding of world-wide processes making for the nurture of human life,” Addams founded the Women’s Peace Party, which became the Women’s International League for Peace and Freedom. She assisted Herbert Hoover in providing food and other relief to women and children of enemy nations. Jane Addams was awarded the Nobel Peace Prize in 1931. The key to Jane Addams’ success as a social justice activist was working to address real people’s problems at their roots. The best way to approach any human problem, she believed, was to approach people actively and sympathetically, learn to understand the challenge or difficulty from their perspective, and use that knowledge to address the problem’s root causes. Mary McDowell (l) and Jane Addams (r).